Plays with elite leverage on the interior with complementary hand usage. He has an endless array of counters and hand moves to rely on when playing then run and the pass. Can perform a double swim, club rip, bull rush, and push pull at an exceptionally high level. Rarely ever gives up his chest, and can disengage from 1v1 matchups with ease. On double teams, he shows the capability to split by dropping his outside knee and driving his hips and legs forward. Consistently locks his hands into the interior of the offensive lineman’s chest, which gives him control of the lineman’s movements. He locks out with thumbs up which torques and locks his elbows in order to make it harder for the offensive lineman to replace his hands. Impossible athlete for size, as he has the ankle flexion and hip fluidity to function laterally and be an upfield penetrator. He is extremely explosive out of his stance, as his first step quickness and elite athleticism makes him too quick for interior blockers to strike at with a stable platform and square shoulders. Williams can easily split zone blocks and move laterally down the line of scrimmage to close on ball carriers. Powerful anchor at the point of attack who will never be moved out of his gap. Is explosive, powerful, and can convert speed to power on passing downs to condense the pocket. Possesses versatility to play anywhere on a down front and perform at a high level. No character concerns. Possesses average length and physical tools. Could stand to add more mass and thickness at the next level. 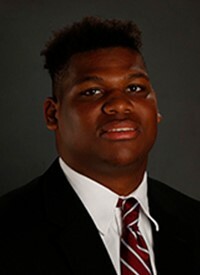 Quinnen Williams is an elite interior defensive lineman with the hands, athleticism, power, and flexibility to be an All Pro his rookie year. He is constantly disruptive on a game by game basis, and projects to a disruptive, penetrating 3 technique year one.